Feeling tight in the hips? Maybe the lower back is a little out of whack? Bridge pose can help with that! This pose is great to hold after the body is already warm or it can be used during warmup using a short, slow and flowing movement. Laying on the back, bend the knees and place the feet firmly on the floor. Arms are alongside the body with palms facing down. 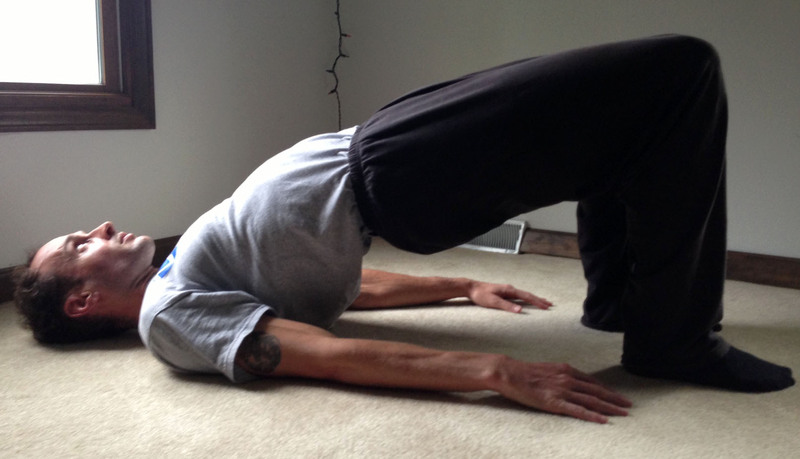 With a deep inhale press the feet and hands into the floor and lift the hips toward the sky. Take a few breaths here working to lift the hips higher and draw the chest upward. The curve in the spine should happen mostly in the middle back (thoracic spine). Maintain good alignment by keeping your gaze directed toward the knees and making sure the knees stay in line with the ankles. To deepen the pose, walk the shoulders under the body slightly and clasp the hands together, palms facing inward. Lift higher, and maybe come up onto the toes or lift one leg at a time. After slowly returning the hips to the ground, take a moment to come back to center and then bring the knees into the chest for a counter stretch. Knees splay out to the sides. Place a block or yoga ball between the knees and squeeze as you elevate the hips. Drawing the thighs inward and keeping the feet solidly and evenly driven into the ground will help give you good alignment in the knees and legs. Too much pressure on the neck. In this pose, and any poses that have potential to put weight into the neck (cervical spine), pay close attention to your form. Rest your weight in the shoulders rather than on your neck or head and draw the chest upward moving drawing the hips up and forward. Posted in Pose Breakdown and tagged Abdominals, asana, Back, Bridge Pose, chest, core, Gluteals, hip flexor, Hips, knees, Legs, Pose Breakdown, quadriceps, Rejuvenation, Shoulders, thighs. Bookmark the permalink.